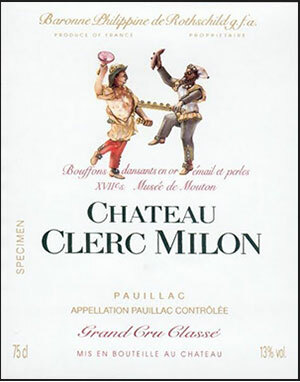 Tasted at Bordeaux Index's annual 10-Year On tasting in London.The 2006 Château Clerc-Milon has a very respectable bouquet: red fruit rather than black, laced with tobacco, woodland and dried herbs aromas, quite Saint Julien-like in style. The palate is medium-bodied with a sweet, succulent opening: blackberry and raspberry fruit laced with salt and a dash of white pepper that leave the mouth tingling on the Merlot-driven finish. Tasted January 2016. Drink 2016-2030. Offers a gorgeous nose of crushed blueberry and cream, with a hint of milk chocolate. Full-bodied, with velvety tannins and a pretty finish. Best after 2014. Bright ruby-red. Expressive aromas of currant, tobacco, graphite, herbs, roast coffee and smoky oak. Supple, solid and broad, with a mouthfilling fleshiness leavened by good energy and vinosity. There's a medicinal reserve to the redcurrant and dark chocolate flavors. Finishes broad and long, with substantial dusty tannins and very good length. A more muscular style than Armailhac, also from the team at Mouton-Rothschild, and in need of at least five years of cellaring. Aromas of currants and dark berries with hints of minerals. Full body with super-integrated tannins and a slightly austere and intense tannin backbone. But it’s pretty and attractive. Drink or hold.